The sleek, innovative, white Dagmar shoe features a classic, figure skate design. This product is primed for performance, best suited for competitive beginners and active skaters. Made for ease of navigation and movement, beginning skaters will enjoy the seamless movement of this boot. The durable upper is reinforced with multi-layered leather, accompanied by a water resistant PUR exterior and seamless finish. The boot comprises a lush interior lining reinforced with RELAST textile. The ankle support and padding is primly built for efficiency and comfort. Calf support is reinforced by the lavish and malleable collar. This product is equipped with LTT technology, bolstering stability and precision. Reinforced with a PVC outsole, this boot has a contemporary stylish design, fit with a logo-clad heel. The heel offers maximum durability and support, along with a subtle display of the BOTAS logo. The layered thermal technology is ideal for heat absorption and retention in frigid climates. 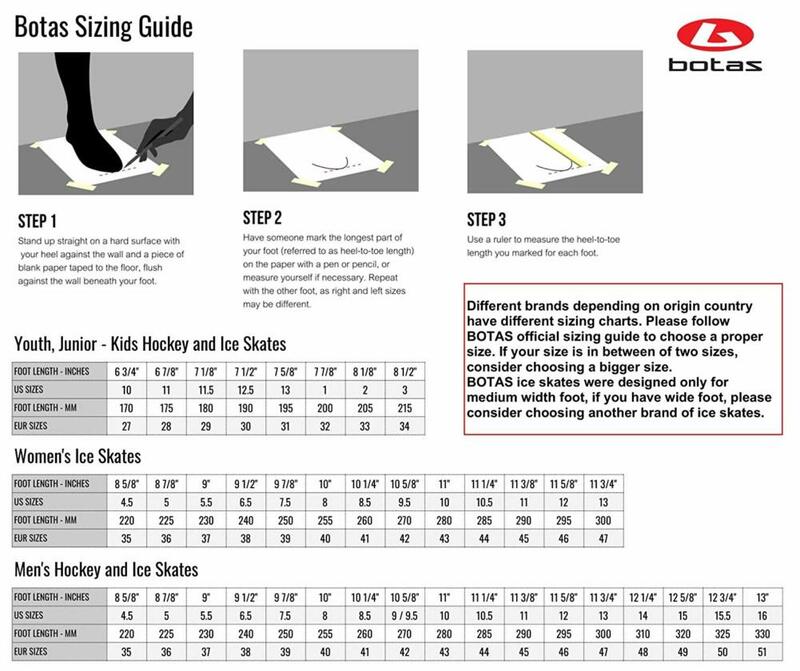 Skaters can engage actively in their sport while maintaining a comfortable temperature. The white and brown sole offers stylistic versatility, and a neutral, yet, clean finish. The thickly coated leather makes the shoe less susceptible to wear and tear. The sole is highly resistant to damage and equipped with a sustainable, solid material. The luxurious addition of PRINCESS skates gives this boot an added tinge of efficiency and quality. The mirror finish surface skate has a European TUV GS certificate. The recommended care options are as follows. Wearers are recommended to clean shoes after use to prevent debris buildup. The suggested cleaning method is to gently wash with water. Detergents should be avoided. Insole should be removed during a wash, and the shoe should be dried at regular room temperature. The use of a traditional dryer is not recommended. This product should remain out of the vicinity of heat sources to avoid damage or destruction of the boot. Price: $94.95 – $125.95 & FREE Shipping. The sleek, innovative, white Dagmar shoe features a classic, figure skate design. This product is primed for performance, best suited for competitive beginners and active skaters. Made for ease of navigation and movement, beginning skaters will enjoy the seamless enhanced of this boot. The durable upper is reinforced with multi-layered leather, accompanied by a water-resistant PUR exterior and smooth finish. The boot comprises a lush interior lining reinforced with RELAST textile. The ankle support and padding are primly built for efficiency and comfort. Calf support is reinforced by the lavish and malleable collar. This product is equipped with LTT technology, bolstering stability and precision. Reinforced with a PVC outsole, this boot has a stylish contemporary design, fit with a logo-clad heel. The heel offers maximum durability and support, along with a subtle display of the BOTAS logo. The layered thermal technology is ideal for heat absorption and retention in cold climates. Skaters can engage actively in their sport while maintaining a comfortable temperature. The white and brown sole offers stylistic versatility, and a neutral, yet, clean finish. The thickly coated leather makes the shoe less susceptible to wear and tear. The sole is highly resistant to damage and equipped with a sustainable, solid material. The luxurious addition of PRINCESS skates gives this boot an added tinge of efficiency and quality. The mirror finish surface skate has a European TUV GS certificate. The recommended care options are as follows. Wearers are advised to clean shoes after use to prevent debris buildup. The suggested cleaning method is to wash with water gently. Detergents should be avoided. Insole should be removed during a wash, and the shoe should be dried at regular room temperature. The use of a traditional dryer is not recommended. This product should remain out of the vicinity of heat sources to avoid damage or destruction of the boot.